The affordable 303 Series 802.11ac Wave 2 campus access points deliver high performance to medium density enterprise environments such as schools, retail branches, warehouses, hotels and enterprise offices, where the environment is cost sensitive. As a Unified AP, they can be operated with (ArubaOS mode) or without a controller (InstantOS mode). The AP-303P includes a second Ethernet port with PoE out to daisy-chain the wired network to connect and power any network device such as IP camera, IoT gateway, or even a second access point. This feature results in reducing the cost and simplifying the installation of multiple devices by sharing switch ports and cabling. The AP-303P has integrated Zigbee radio for IoT connectivity. With an integrated Bluetooth radio, the 303 APs can be used as an Aruba beacon for advanced location and indoor wayfinding, asset tracking, and proximity-based push notification services. AppRF technology enables prioritization and policy enforcement for business-critical enterprise apps like Microsoft Skype for Business. 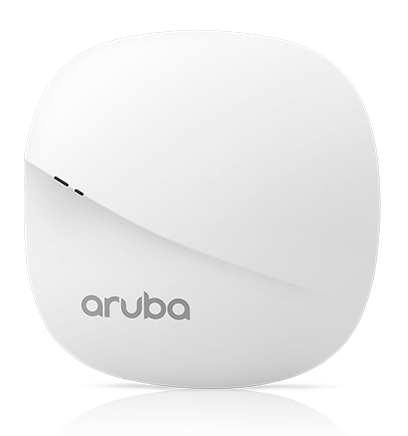 An integrated Aruba Beacon delivers location services that can be centrally managed. The 303 Series AP is a unified AP that supports both controller-based and controller-less deployment modes, providing maximum flexibility. Controller-based mode – When deployed in conjunction with an Aruba Mobility Controller, Aruba 303 Series Access Points offer centralized configuration, data encryption, policy enforcement and network services, as well as distributed and centralized traffic forwarding. Controller-less (Instant) mode – The controller function is virtualized in a cluster of APs in Instant mode. As the network grows and/or requirements change, Instant deployments can easily migrate to controller-based mode. For large installations across multiple sites, the Aruba Activate service significantly reduces deployment time by automating device provisioning, firmware upgrades, and inventory management. With Aruba Activate, the Instant APs are factory-shipped to any site and configure themselves when powered up. Two vertically polarized dual-band downtilt omni-directional antennas for 2x2 MIMO with peak antenna gain of 3.3dBi (2.4GHz) and 5.9dBi (5GHz) per antenna. The antennas are optimized for horizontal ceiling mounted orientation of the AP. The downtilt angle for maximum gain is roughly 30 degrees. Combining the patterns of both antennas per radio, the peak gain of the average (effective) pattern is 2.1dBi in 2.4GHz and 4.6dBi in 5GHz. The AP ships with a (black) mount clips to attach to a 9/16-inch or 15/16-inch flat T-bar drop-tile ceiling. Several optional mount kits are available to attach the AP to a variety of surfaces; see the Ordering Information section below for details. Right-Angle Wall Mount Brackets for AP-220 & AP-3x0 series APs?